The mining of resources contained in asteroids, for use as propellant, building materials or in life-support systems, has the potential to revolutionise exploration of our Solar System. To make this concept a reality, we need to increase our knowledge of the very diverse population of accessible Near Earth Asteroids (NEA). 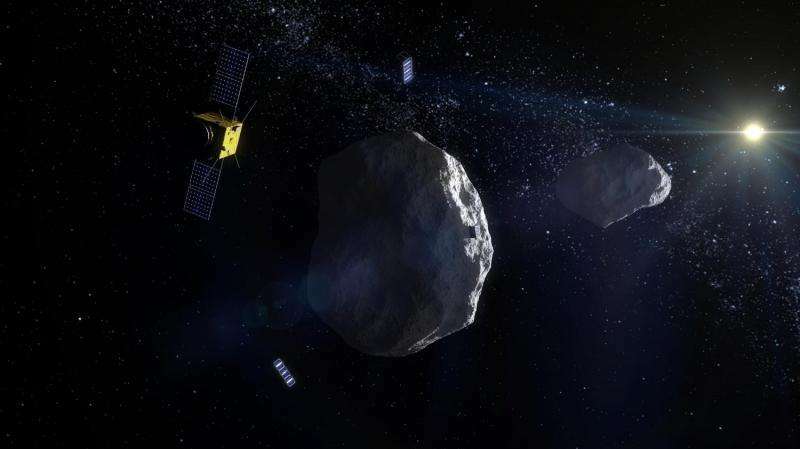 Last year, dozens of the world's leading asteroid scientists and asteroid mining entrepreneurs came together in Luxembourg to discuss key questions and identify scientific knowledge gaps. A White Paper outlining the results of that discussion, "Answers to Questions from the Asteroid Miners" will be presented at the European Planetary Science Congress (EPSC) 2017 in Riga on Tuesday 19th September by Dr JL Galache and Dr Amara Graps. "Asteroid mining is this incredible intersection of science, engineering, entrepreneurship and imagination," says Galache of Aten Engineering. "The problem is, it's also a classic example of a relatively young scientific field in that the more we find out about asteroids through missions like Hayabusa and Rosetta, the more we realise that we don't know." The aim of the Asteroid Science Intersections with In-Space Mine Engineering (ASIME) 2016 conference on September 21-22, 2016 in Luxembourg City was to provide an environment for the detailed discussion of the specific properties of asteroids, with the engineering needs of space missions that utilise asteroids. Outcomes of ASIME 2016 Conference produced a layered record of discussions from the asteroid scientists and the asteroid miners to understand each other's key concerns. The White Paper covers questions surrounding the need for asteroid surveys in preparing for mining missions, the asteroid's surface and interior, implications for astrobiology and planetary protection and other questions relating to policy and strategy for developing a roadmap for advancing asteroid in-space resource utilisation. Galache explains: "NEAs are usually discovered when they are at their brightest, so our best chance of studying them is by immediately following up detections with further observations to characterise their shape and spectral properties. That needs good quality, relatively large, dedicated telescopes that are available at short notice. We don't have reliable access to these facilities right now." Further studies are needed to understand the link between meteorites and asteroids, and to share data more widely about the composition of meteorites so that more accurate simulant asteroid soils, or "regolith", can be created. This is important for understanding which asteroids hold which resources, and for preparing for the practical side of a mining mission, such as landing and extraction of material. "Aside from samples returned from a handful of missions, the only way we can study the composition of asteroids is by analysing light reflected from their surfaces, or by examining fragments that have landed on Earth in the form of meteorites," says Graps of the University of Latvia and the Planetary Science Institute, Tucson, Arizona. "Both these techniques have limitations. Spectral observations come from the 'top veneer' of the asteroid, which has been space weathered and subjected to other kinds of processing. Meteorites are crucial, but they also lack part of the story: fragile constituents of primitive material contained within asteroids may be lost during atmospheric entry. At the moment, our mapping of types of meteorites back to the different classes of parent asteroid is not that robust." Three quarters of known asteroids are classed as Carbonaceous or "C-type", dark, carbon-rich objects. However, most NEAs are from the Silicaceous "S-type" class of asteroids, which are reddish-coloured stony bodies that dominate the inner Asteroid Belt. For asteroid miners looking for water to use in rocket fuel or life support systems, being able to identify the class of asteroid is vital. Carbonaceous chondrite meteorites have been found to contain clay minerals that appear to have been altered by water on their parent body. While these meteorites are thought to be derived from sub-classes of C-type asteroids, there is not an exact match with any single spectral class. A short-cut to understanding an NEA's composition could be to identify where in the Solar System they formed and look at the characteristics of their "orbital family". Thus, another knowledge gap is the link is between the dynamical predictions of where an NEA originates and its actual physical characterisations. Information is also sparse on the size of grains at the surface of the asteroid. The asteroids Eros and Itokawa have similar spectral signatures and reflectiveness, but rendezvous missions show that they have very different regolith properties. 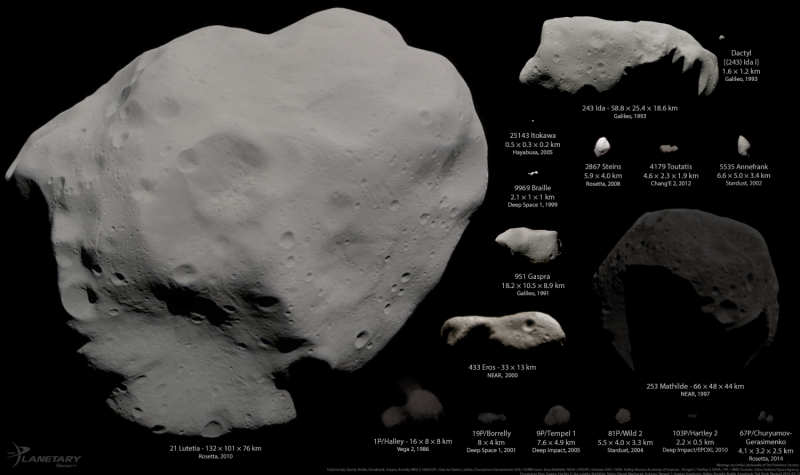 NEAR Shoemaker showed that Eros is covered in fine dust, while Hayabusa revealed that the surface of Itokawa has chunky blocks tens of centimetres in diameter. Comprehensive knowledge of regolith properties at asteroids' surface and subsurface will be vital for developing strategies for landing and extracting materials. However, as yet, no mission has explored how asteroid regolith might vary with depth. "Results from ESA's Rosetta mission showed that the surface of comet 67P/Churyumov Gerasimenko is much denser than its interior. It may be that we'll find the same thing if we dig down into the regolith of NEAs. But at the moment, we just don't know," said Graps. "Asteroid mining techniques will need to adapt to the low-gravity environment. Possible solutions include cancelling out action-reaction forces by digging in opposite directions at the same time, or by producing a reaction force, such as by strapping a net around the asteroid for robots to grab onto while they dig," says Galache. "It's a challenge! But answering the questions posed in this White Paper will be an important first step."